We’re featuring a potpourri show today. Many mainline churches are adopting an increasingly hostile attitude towards Israel, bordering on anti-semitism. The Presbyterian Church just had such a battle in its convention. Dexter van Zile from the Committee for Accuracy in Middle East Reporting (www.camera.org) comes on board for a report. Freedom of speech is under duress once again. The city of Dearborn, Michigan, is under increasing criticism for arresting four Christians, who were peacefully handing out literature at an Arab festival in that city. Robert Muise is the attorney handling their case for the Thomas More Law Center (www.thomasmore.org). Persecution of Christians is on a dramatic rise around the world. What should the Church do in preparation of this difficult reality? 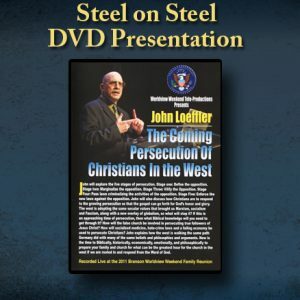 John gave this important speech at the Worldview Weekend conference in Branson, Missouri in the spring of 2011 as an update to his previous presentation called “The Coming Persecution of Christians in the West”.